The Bureau of Labor Statistics (BLS) had some good news for us yesterday. The unemployment rate increased from 7.8 percent to 7.9 percent. You read that right: it’s good news that the unemployment rate increased. In fact, economists have been waiting for it to increase, and have been a little disappointed that it didn’t increase sooner. This might sound a little balmy, but there’s method to this madness. It’s all in the reason the unemployment rate increased. 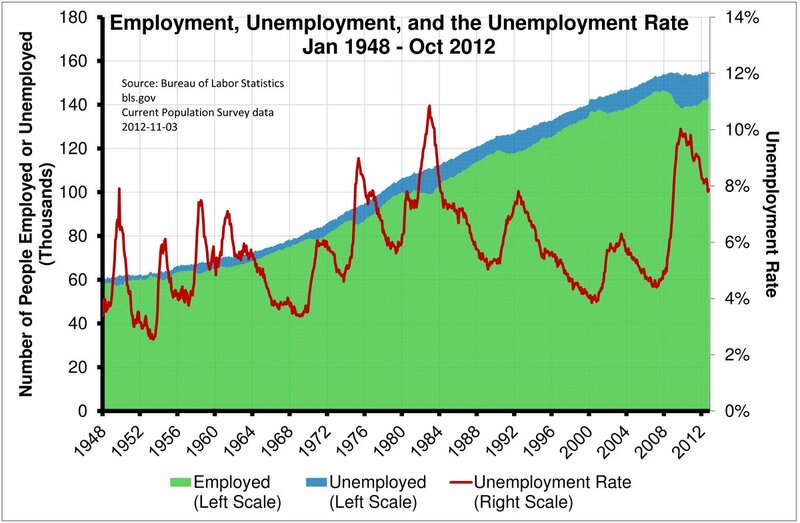 The unemployment rate is the number of unemployed people divided by the total number of unemployed plus employed. The BLS collects these numbers by contacting 60,000 households every month. To be “unemployed”, you have to be actively looking for work. People who are aren’t actively looking aren’t included, even if they’d like to be working. During a severe recession like we just had, lots of people get so discouraged about finding work that they give up and stop looking – or, as economists say, they exit the workforce. They’re no longer considered either employed or unemployed if they’re not actively looking. When job markets improve after the downturn, many of these discouraged workers again start to look for work. This is a good sign for the economy, and typically indicates that things will continue to improve. In October, the number of unemployed in the U.S. increased by 170,000, to 12.3 million. At the same time, the number of employed increased by 410,000, to 143.4 million. As a result, the unemployment rate increased from 7.8 to 7.9 percent. I’ll be anxious to see the JOLT (Job Openings, Layoffs, and Turnover) data that will be coming out on Tuesday, November 6. It will provide more details about exactly what is going on in the job market, and what is (likely) causing it. What Happened to the Unemployed? According to the numbers released Friday, the number of people unemployed in the U.S. decreased from 12.5 million August to 12.1 million September, and the unemployment rate decreased from 8.1 percent to 7.8 percent. 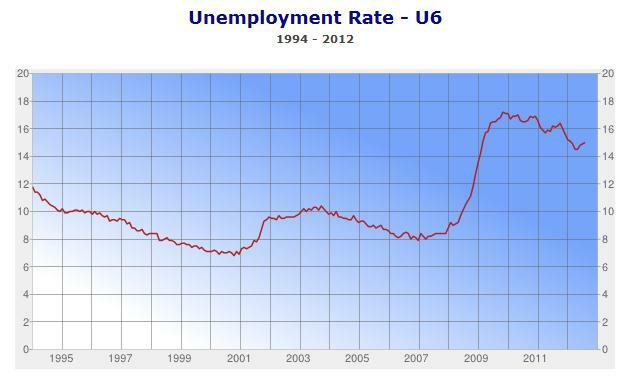 So what happened to these 12.5 million unemployed people from August to September? It turns out that 7.3 million of these were still unemployed in September. That’s well more than half of them. Another 2.8 million of the August unemployed had left the Labor Force by September. This could be because they just quit looking because they felt it was useless, or because they’d gone back to school. Or they retired, or had children and decided to stay home. Or maybe they won the lottery. Regardless, by September they were neither working nor looking for work. Finally, 2.4 million – 19 percent – had found jobs by September. The reason that the number of unemployed only decreased by 400,000 is that, at the same time these 2.4 million were finding jobs, another 1.9 million lost jobs they had, and 2.9 million entered the labor force and started looking for work. Here’s hoping that number keeps going down. People throw around a lot of different unemployment rates and numbers, and it can get confusing sorting them out. In the U.S., the basic unemployment rate is defined as people age 15 and over actively looking for work, but not actually working for pay. However, these aren’t the only people to be concerned about in labor force. Some people may have looked unsuccessfully for work that they’ve simply given up and no longer even bother to look. Others may be working part-time because they can’t find full-time jobs. These people aren’t “unemployed”, but they’re still a indicator of problems in the economy. These people are sometimes called the “hidden unemployed”. Labor economists sometimes add the numbers of these people together to calculate what they less creatively call the U-6 Unemployment Rate. In any case, it’s important to consider these hidden unemployed, though equally important not to confuse these numbers with the real unemployment rate.